From curriculum design to classroom pedagogy, Jonathan’s absorbing new book provides a thoughtprovoking guide to the principles and practice of creating inclusive, inspiring and authentic learning opportunities for all of our pupils. "A treasure trove full to the brim with creative and practical ideas around pedagogy and the primary curriculum." 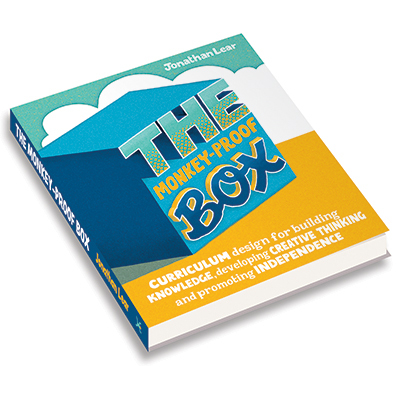 ‘The Monkey-Proof Box: Curriculum design for building knowledge, developing creative thinking and promoting independence’ is a manifesto on how to dismantle the curriculum we’re told to deliver and construct in its place the curriculum we need to deliver. Drawing on his ground-breaking work as an inner-city primary school teacher, Jonathan Lear sets out how teachers and leaders can deliver a curriculum rich in authentic learning experiences that help children learn from one another and grow into empowered, knowledgeable and creative thinkers who are driven by insatiable curiosity. "This is genius; Lear at his most irreverent and profound best"
"The Monkey-Proof Box’ takes the reader on a journey that, for an educational text, is unusually gripping and extremely readable." "Crisp, cool and cutting on core curriculum principles – it’s also very funny." To find out what’s going on with all the gorillas, take a look at Jonathan’s first book ‘Guerrilla Teaching’ – it’s full of the kind of ideas, thinking and practical advice that’ll ensure our children get the education they deserve regardless of what we’re told. Guerrilla Teaching is a revolution. Not a flag-waving, drum-beating revolution, but an underground revolution. It’s not about changing policy or influencing government; it’s about doing what you know to be right, regardless of what you’re told. It’s a book its author never meant to write, but it was just too important not to. "A wonderful escape to teaching that is gripping and enjoyable - engage with this book and be a learning guerrilla!" "Full of great ideas to take immediately into the classroom and a philosophy that is refreshing and forward thinking. A great read for the next generation of teachers!" "Jonathan Lear is the voice of the true expert – the excellent classroom teacher who, through experience and experimentation, knows what works for his pupils and is not prepared to let outside interference get in the way of doing what he knows is right for their education and wellbeing." 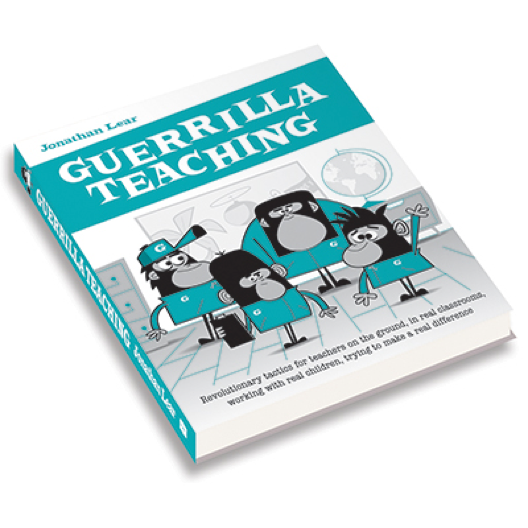 "Guerrilla Teaching is a great, practical and inspirational book for any teacher at any point in their career. It’s refreshing to find a book that offers support and advice that will actually make a difference to the way the children we teach learn and enjoy school. It’s a book that reminds us to consider the type of people we want our children to grow up to be and how to help them achieve that. It reminded me why I choose teaching as a career."